Grand Central is truly grand again! After a four-year monumental renovation, the terminal is even grander than when it first opened in 1913. The revitalized Grand Central combines the romance of train travel, the history of a magnificent terminal building from a bygone time, a destination for superb restaurants, and convenience of outstanding retail shops. 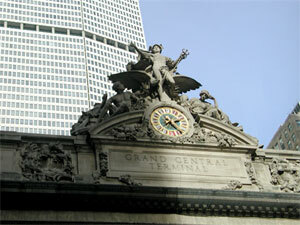 To truly appreciate this remarkable landmark building take a FREE tour, offered every Friday at 12:30pm by the Grand Central Partnership. 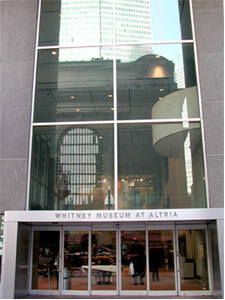 Meet at 42nd Street in front of the Phillip Morris/ Whitney Museum across the street from Grand Central. 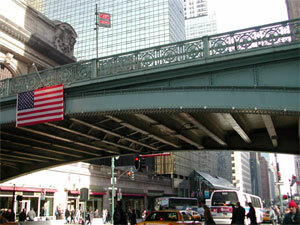 For more information on this tour call (212) 697-1245 or go to their web site www.grandcentralterminal.com. 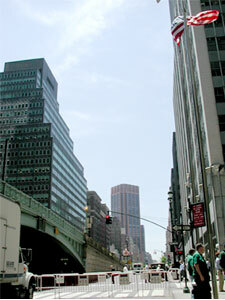 Grand Central Terminal is located at 42nd street between Vanderbilt Avenue and Lexington Avenue. 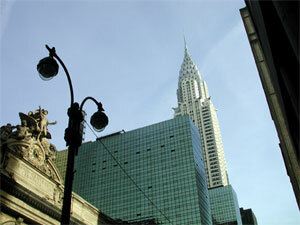 Hercules Statue & The Chrysler Building view. Statues of Hercules, Minerva and Mercury surrounding a thirteen foot clock. 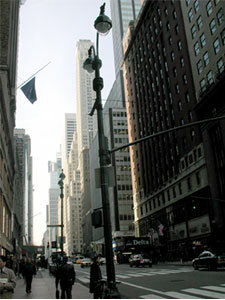 Grand Central Station on 42nd Street.